Subsea heave compensator for pipe laying jointing alignment with diver "inch-up inch-down". 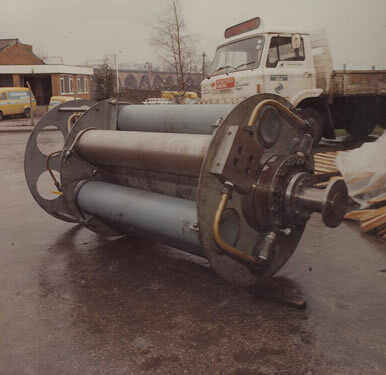 From A-Z, literally Alaska to Zambia, Via :- Gulf of Mexico deep water, North Sea, Nigeria, Arabia and Indonesia; starting in 1963 HydroTrole has provided high pressure hydro-pneumatic equipment, and for the Hydrocarbons Oil and Gas industries. original fluid power hydraulic and hydropneumatic equipment features. Hydrotrole is your most versatile hydropneumatic special equipment help source including accumulators, pulse dampeners, pipeline shock, & temperature volume expansion / contraction compensators, and wave motion Example the Crestpicker (top right), and other unique protection devices for oil and gas rigs and platforms. from PulseGuard that guards against pulsation, from ShockGuard that guard against shock in large pipelines and from water hammer, and Liquid Dynamics Intnl. technical services. pressures up to 3000 Bar (43,000 PSI). Products have been and are manufactured under a quality system, previously: ISO 9001:1994 [DNV Number 95-LON-QA-458 (15105)]. And jointly: ASME "U" Cert 29,289 5 Nov '96 through 5 Nov '99, and through 5 November '02 [Kemper/BVQI - QSC 97028/50591 1997/98]. Now via: LDi UK - RSA to ISO 9001:2000. latterly by QMS International to BE EN ISO 9001 : 2008 Certificate Number GB 18545 Expiry 30 Sept. 2020. When you require products assembled under the auspices of that third party they will come from the UK source. The hardware, mainly modular construction (178,123 different products) were licensed from Martin Packer (Patents, Designs, and Tech Support), as was the PULSEVIEW software for pulsation modeling and prediction and SHOCKVIEW shock water hammering analysis. In addition, we can provide analysis based on oscillographic data capture, finite element analysis using ANSYS, and pipe vibration frequency analysis using Caesar II. 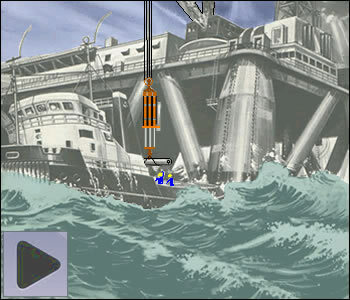 Crestpicker is the fully automatic heave compensator for offshore cranes. Hydraulic power is accumulated from the up and down pumping / heaving movement, then when full the accumulators discharge into the retracting lift cylinder picking the load well clear from the supply boat height on the crest of the next wave. By enabling supply of drilling tubulars to work-overs and offshore production platforms and to exploration rigs in higher sea states, the "weather window" is greatly increased, changing the pre-production cost equation and bringing hydrocarbon flow on line sooner. For lay-barge working, submerged versions have been developed allowing pipe jointing in high swells. These units reduce to days spent per contract, and protect against incalculable losses on fixed price contracts. Whilst the crane is lifting from the safe clear point, the energy in the crestpicker decays away (at a rate that can be easily reset on location) and by the time the load is set down on the platform or semisub deck. The unit is in soft cushion mode. The soft cushion has a 2-10 ms response time and may be sensitsed down to + 100 kg or less. In use this auto motion compensator, which may be crane retrofitted, or in its alternative form merely hook mounted, does not require signals or telemetry of any kind. Remote manual override is provided as an optional extra. The cane operator winches in until the double legs, slings or chains are taut, stops, the load heaves by virtue of the heave compensator strut (our original product) and this action stores energy which is then automatically vented back into the strut at the top of the wave crest.